Are you ready to organise and store your lawn and landscaping tools, children's bicycles, or other backyard equipment? A steel garden shed is the best way to protect your outdoor belongings from the harsh elements while still having them easily accessible when you are ready to use them. Why Choose a Garden Shed? Your backyard shed is the best way to keep your tools, supplies, and outdoor items exactly where you need them. Depending on the layout of your property, you may not want to clutter your garage with landscaping tools or a lawnmower. A garden shed provides that extra storage space right where you need it. For those who own several acres of property, it may be inconvenient to store certain items near your home, when you actually use them on the other end of your property. A garden shed will allow you to keep the items you need exactly where you use them. 1) Galvanised steel construction - This sturdy material holds up under severe weather conditions, is fire resistant, and termite proof. 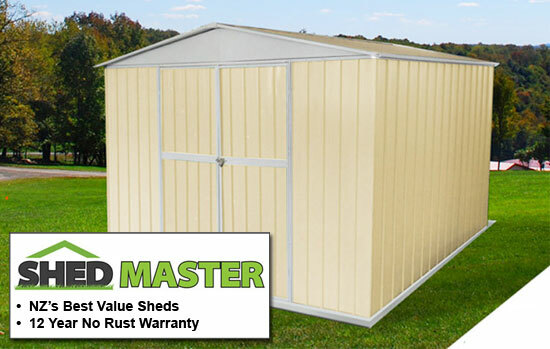 2) Rust proof - Our steel garden sheds always come with a 12 year no rust warranty. 3)A Variety of Sizes - With a wide range of sizes to choose from, you can conveniently store large yard equipment or just a few garden tools. 4) Simple to Assemble - You'll receive your garden shed flat packed, ready for quick and easy assembly. Your new shed can be in place and ready for use the same day you receive it. 5) Hinged Door - A hinged door provides that extra quality you are looking for in an outdoor storage shed. Hinged doors are safer and more reliable than sliding doors, that often stick or become difficult to slide. Our quality, strength tested storage sheds are straight from the manufacturer to your door. Order today and take advantage of our quality products and excellent prices.